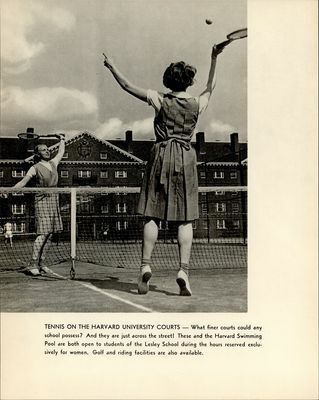 "Tennis on the Harvard University Courts"
Promotional material for the Lesley School, featuring two students playing tennis in the Lesley gym uniform. The full text reads: \"Tennis on the Harvard University Courts - What finer courts could any school possess? And they are just across the street! These and the Harvard Swimming Pool are both open to students of the Lesley School during the hours reserved exclusively for women. Golf and riding facilities also available,\" written in the border.